Lois Collins Powala, 83, of West Newton, passed away Tuesday, November 13, 2018 at UPMC Presbyterian Hospital in Pittsburgh. Lois was born February 12, 1935 in Monongahela, the daughter of the late Albert and Rose Collins of Monongahela, PA. Lois was married to Virgil J. Powala, who preceded her in death in September of 2010. 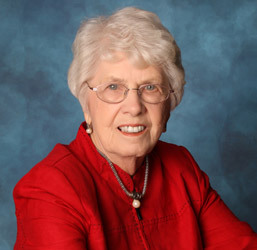 Lois was a resident of West Newton and an active participant in the advancement of local affairs. She worked at National City Bank for more than 30 years until her retirement as manager and Vice president. She was active as a volunteer with Monongahela Valley Hospital (MVH) providing community outreach with senior hospital leaders and physicians and was a member of the Hospital's Patient Safety Committee and was the recipient of the Gibbons Award for Dimensions in Community Service. Lois was also a member of the West Newton Rotary Club, Women’s Club, and other local community groups. Lois also enjoyed being a member of several bridge card clubs. Lois was an avid hockey fan and hockey mom chauffeuring her sons across the country and Canada to hockey tournament. She also became a Hockey grandmother attending many of her grandchildren’s games. Lois is survived by her oldest son Christopher Virgil Powala of Philadelphia, his wife Marge and their two children, Katherine Rose Powala, and William Virgil Powala and her son, Timothy Collins Powala of Munich, Germany, and his daughter Tara Sophie Powala. Lois was deeply loved by her family and friends. Family and friends will be received from 2 to 4 and 6 to 8 p.m. on Friday at the J. William McCauley Jr. Funeral Home, 901 Vine St., West Newton, where Funeral services will be held at 10 a.m. Saturday. Interment will follow in West Newton Cemetery. In lieu of flowers, memorials may be made to Charity Care at Monongahela Valley Hospital, 1163 Country Club Road, Monongahela, PA 15063. My mother died suddenly in July of 2017. She had to be transported to Maryland where her final resting place was. Barry was an angel. His compassion and comfort he expresses are just beyond expectations. He treated my Mom like his own and made the process so much easier for me and my family. I appreciate it so much and will never forget his kindness. I want to thank Barry and his staff for assisting our family with the final arrangements for Leonard D. Williams. Barry was so very pleasant throughout the journey to Lenny's final rest with his widow, Shirley and his children during their time of need. We are so very pleased with his services. You will not find a more compassionate and understanding person to help you through such troubled times. Thank you again!